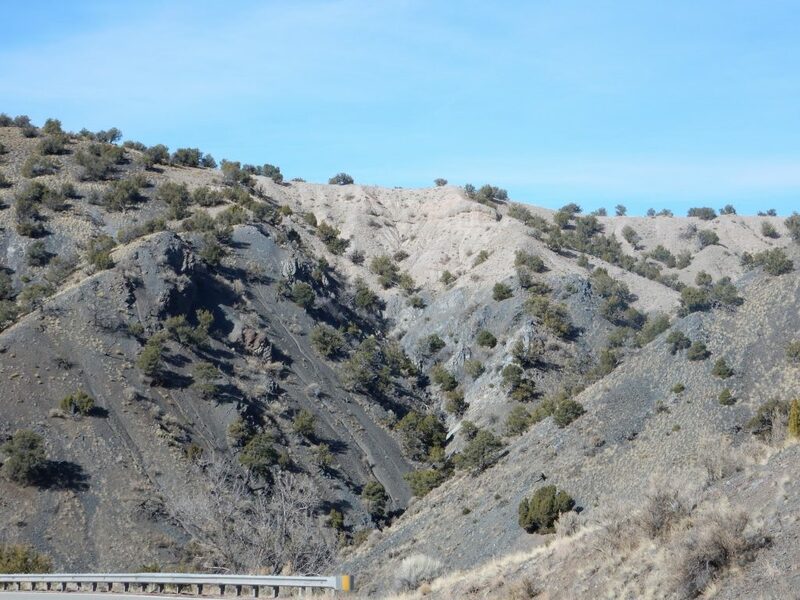 The Dixon area has a lot of interesting geology, including the famous Harding mine. I decided this would be a good place to spend a few hours exploring on my Monday off. I would not actually visit the Harding mine itself, which may sound a little like going to Disneyland and never actually riding Pirates of the Carribean, but I’ve been to the Harding mine with Bruce Rabe fairly recently. Also, you have to fill out a bunch of forms in advance. I decided to focus on the other interesting things in the area. So I packed a lunch, my cell phone, some warm clothes (it is January in New Mexico, after all), my camera and spare batteries, and headed out. I didn’t bother with the SPOT GEN3; I wasn’t planning on getting out of sight of the highway and I am putting off paying the subscription. I got about halfway to the turnoff to Espanola, realized I had forgotten the broken door latch I want to try to find a replacement for at Lowe’s, turned around, got the latch, and started over. At least I remembered the second time around to get a photograph I wanted in morning light. I know; this is practically on my door step. You’d think I had this area photographed to death. But I had not actually gotten around to photographing the prominent vapor notch in the Bandelier Tuff north of White Rock until today. 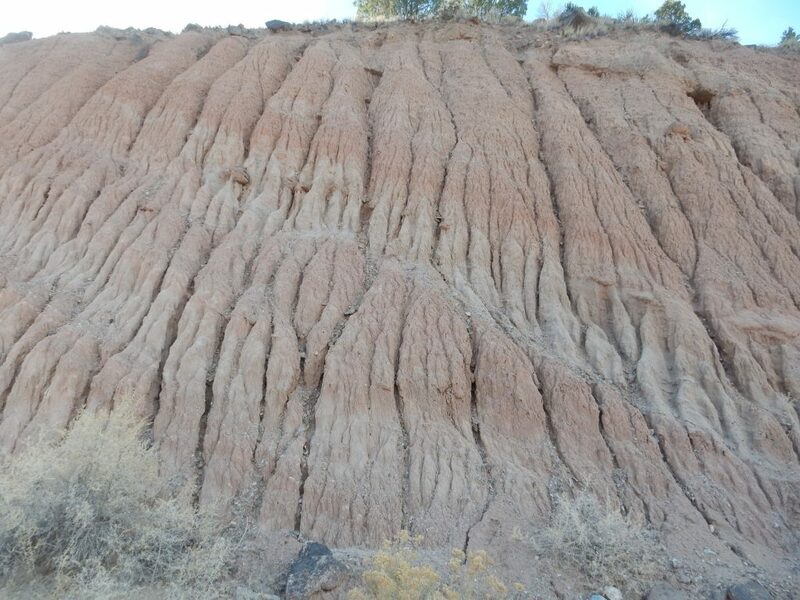 Some background: The Bandelier Tuff is the formation that forms the prominent finger mesas all over the Pajarito Plateau, where Los Alamos and White Rock are located. 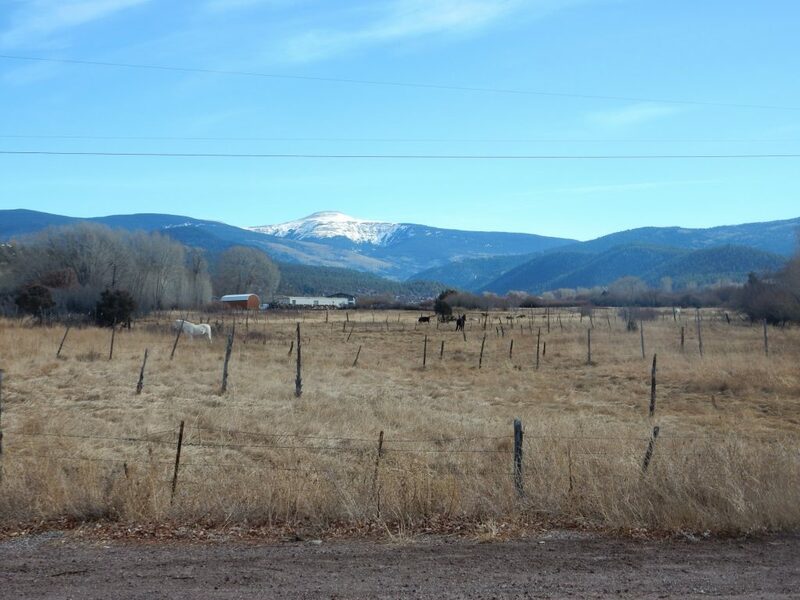 It has three members, corresponding to three caldera-forming eruptions in the Jemez at 1.85, 1.62, and 1.25 million years ago. 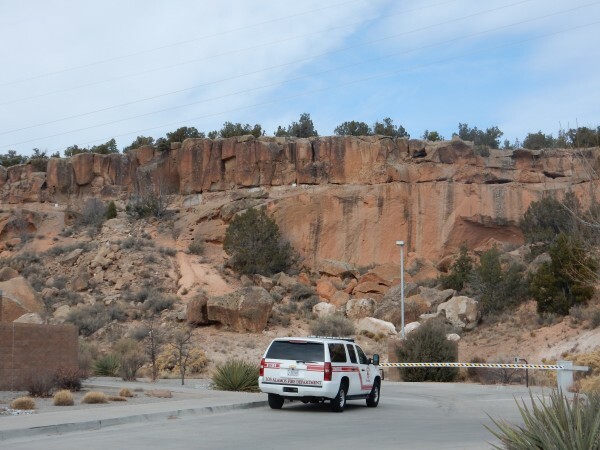 The first, the La Cueva event, was relatively small and deposited tuff beds mostly in the southwest Jemez, though ash from the eruption has also been identified near the pumice mine north of Los Alamos and in the Bandelier wilderness. 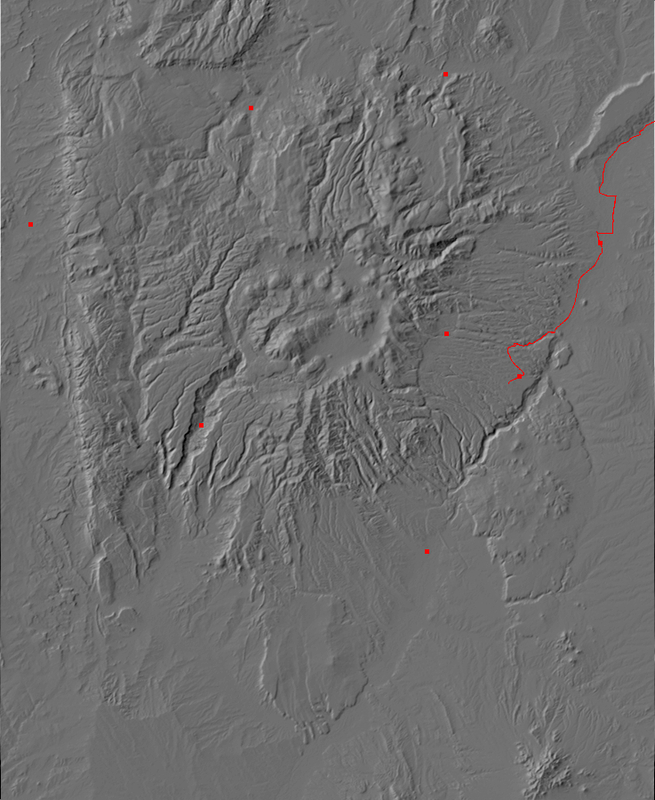 The Toledo and Valles events were both enormous eruptions, producing calderas that more or less coincide. The Toledo event 1.62 million years ago laid down the Otowi Member of the Bandelier Tuff, while the Valles event 1.25 million years ago laid down the Tsherige Member of the Bandelier Tuff. 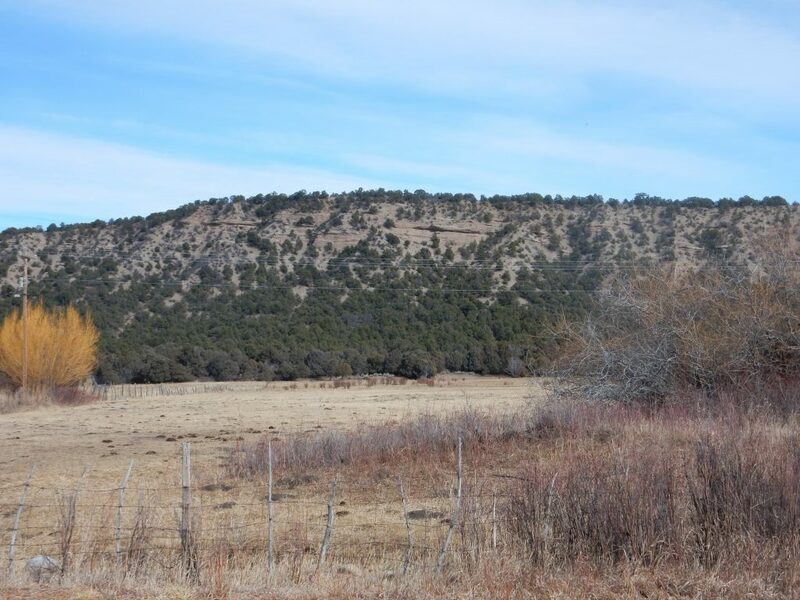 The Otowi Member is very prominent in the western Jemez, somewhat less so on the Pajarito Plateau; the Tsherige is more prominent on the Pajarito Plateau, capping most of the mesas in this area and sitting atop eroded beds of Otowi Member. 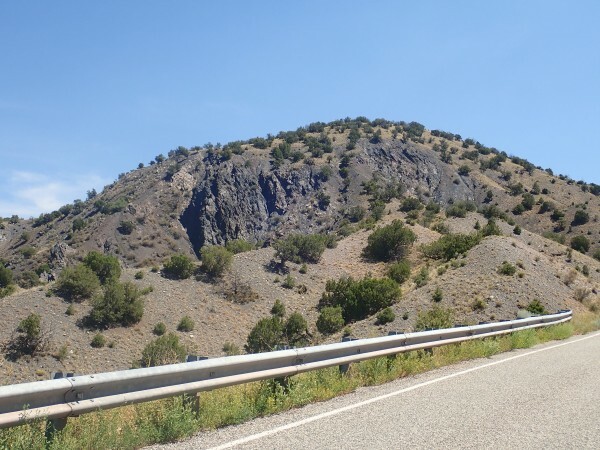 In the White Rock area, there was a prominent ridge of the older Cerros del Rio Basalt (around three million years old) that acted as enough of a topographic barrier that the pyroclastic flows of the Toledo event did not reach the area (or were thin enough to quickly erode away if they did.) 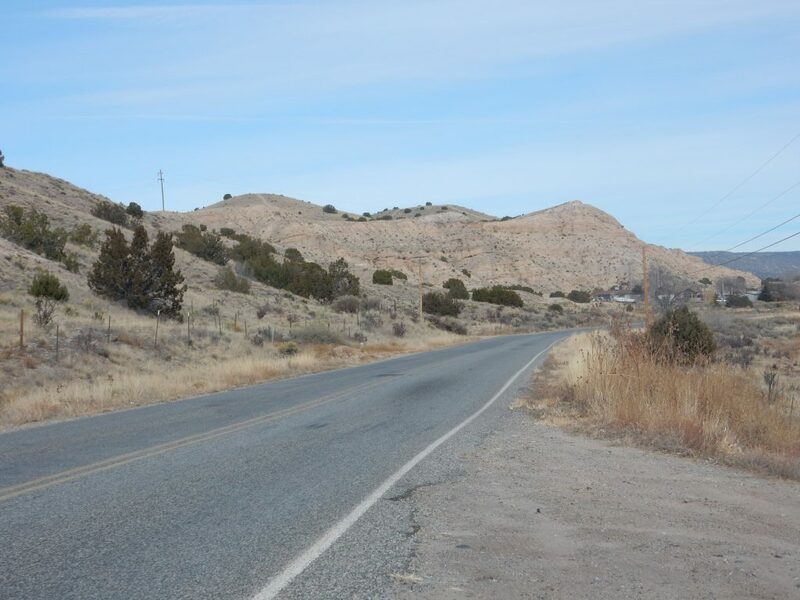 The Tsherige Member made it as far as the areas immediately west and north of White Rock, but Rattlesnake Hill is the only surviving remnant of the flows within White Rock proper. So White Rock is underlain by Cerros del Rio basalt with a thin cover of soil, much of it deposited by wind and water. The Tsherige Member was erupted as a series of pulses, and recent work by geologists suggests that the final pulses may have been as much as decades later than the first pulses. The different pulses are still being sorted out, but it appears that only the first and biggest pulse got as far as White Rock. There’s still some debate whether the cliffs north of White Rock are one or two pulses, mostly because of that vapor notch visible in the photograph, about two-thirds of the way up the cliff. It seems reasonable to assume that the notch separates two separate pyroclastic flows. The notch can be traced for miles in all directions, sometimes forming a prominent ledge halfway up the finger mesas. However, while one geologist (Rogers) took the notch as the boundary between his A and B units of the Tsherige Member, he was careful to not give a firm opinion on whether his lithological units were actually separate flows. Another pair of geologists, Broxton and Reneau, concluded that the notch does not actually mark separate flows; the rock above and below is almost identical in chemical and physical properties, except that the rock below the notch contains glassy volcanic ash while the rock below is devitrified, recrystallized from its original glassy state. They concluded that the top of the flow cooled too quickly to devitrify, and the notch marks a rather sharp transition to the devitrified lower part of the flow. So this picture is for the book, where I talk more about the debate over the eruption history of the Tsherige Member. 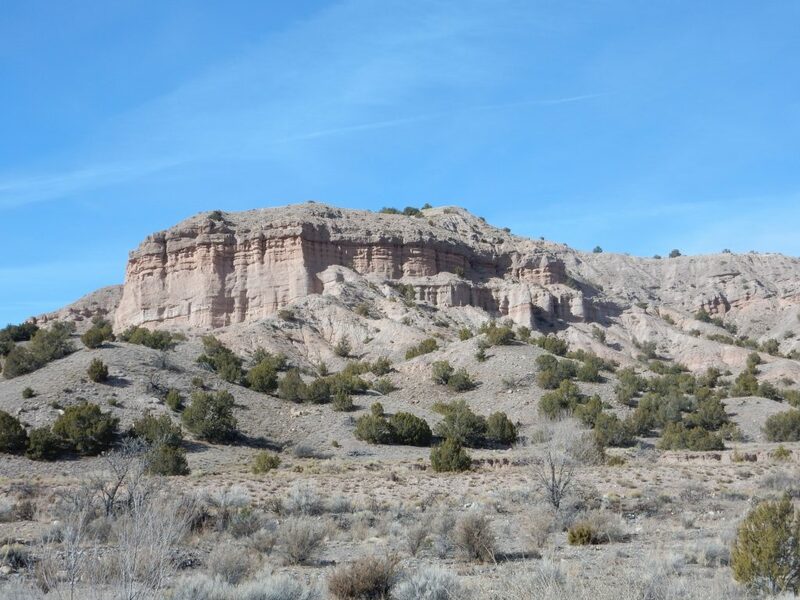 I made up my mind by the time I reached Espanola that I would take a short side trip to see the Chamita Formation south of Black Mesa. I turned towards Ohkay Owinge and almost immediately found myself looking at a road sign that warned against photographing cultural events on the pueblo. I reflected on it a moment, and decided that photographing rock beds was sufficiently different from photographic tribal dances that it would not be bad manners, let alone illegal, to do so. The road forked just past the Rio Grande, and I took the fork that headed for the high ground where I expected the Chamita Formation to be exposed. I’m going to digress slightly here. You may have noticed, if you have clicked the links to Google Map, that the area around the Rio Grande and Rio Chama in the northern Espanola valley is divided into quite thin plots perpendicular to the rivers. This reflects colonial Spanish land practices, where land rights took three basic forms. Plots of land in villages were owned by individual families in a manner not too different from the way most American homeowners own their home lots. Agricultural land, which was always close the the rivers whose water made it arable, was owned by footage along the river: A New Mexican farmer of two centuries ago had title to, say, 100 yards of river frontage, and he could cultivate this back from the river as far as he could stretch the water supply. 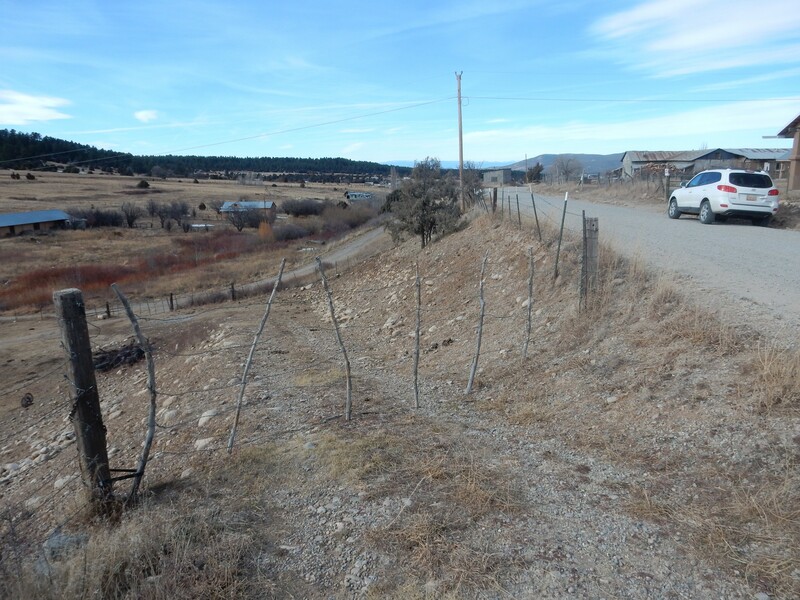 Often this meant from the river to an acequia or community irrigation ditch paralleling the river, but the plots were nonetheless defined in terms of frontage along a waterway. Dry land beyond the river valley, usable only for livestock grazing, collection of firewood, and gathering of other limited natural resources, was not individually owned; individuals held usufructs, use rights, to land outside the agricultural envelope but within the land grant community they belonged to. I find this kind of thing interesting. The hills to my left were marked by a bed of some kind. This is apparently a prominent marker bed extending for great distances around the confluence of the Rio Chama and Rio Grande. It always separates terrace deposits from underlying older sediments of the Santa Fe Group. Let’s unpack that. 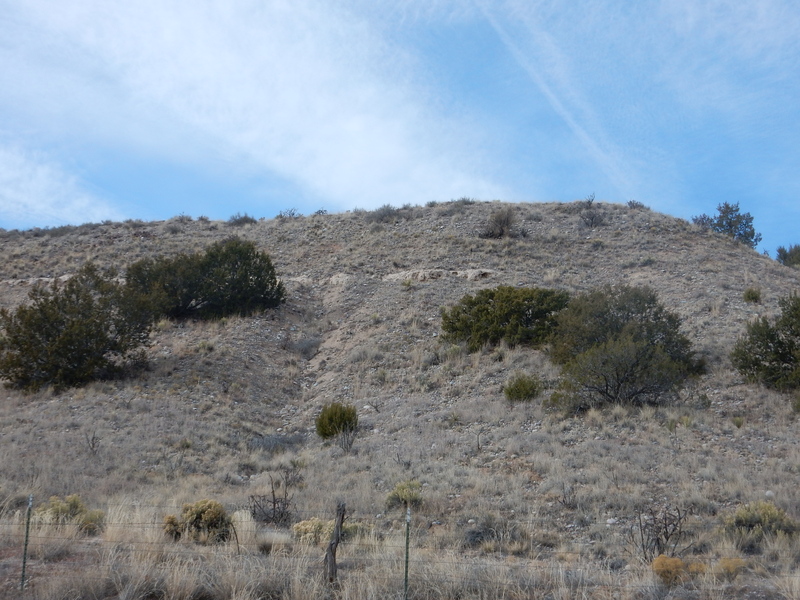 A marker bed is a single bed that is not significant enough to be designated as a member of its formation, but which is relatively thin, highly recognizable, and extensive, so that it is very useful for helping to trace formations across the landscape. Marker beds can be ash beds from a volcanic eruptions somewhere upwind, and marker beds of this kind are common in the Espanola valley. However, this bed is a sedimentary deposit, of gravel and coarse sand, that seems to mark a short interval of time in which coarse sediments were deposited extensively across a floodplain. I’m tempted to think this was some major event in the integration of the Rio Grande system, where a large section of watershed was suddenly added to the system by stream capture, but I don’t really know. And, I know: We now have more to unpack. The Santa Fe Group is the name given to all the sediment beds deposited in the Rio Grande Rift, the great crack in the Earth’s crust extending from central Colorado to El Paso and more or less coinciding with the valley of the Rio Grande. The Rift first began to open 30 million years ago and is likely still slowly spreading, at a rate of a couple of millimeters a year. Sediments from the nearby mountains almost immediately began to fill the Rift, and these are the Santa Fe Group. Two formations of the Santa Fe Group are found in the northern Espanola valley. These are the Tesuque Formation, which is the older, more extensive formation found mostly east of the Rio Grande, and the Chamita Formation, which is younger and found almost entirely west of the Rio Grande. The two look much alike and a few geologists are skeptical of the Chamita Formation, arguing that it is, at most, a member of the Tesuque Formation. Part of the reason I diverted to this area was to see the Chamita Formation near its “type section”, where it was first characterized. River terraces are old river floodplains that have been “stranded” above the river when the river eroded downwards, usually due to a sudden drop of base level. Where rivers have a steep gradient, meaning that the river is flowing rapidly downhill, the water rapidly erodes the river bottom. Where a river slows because it has come to a level stretch, it deposits sediments. The result is that rivers tend to level out in geologically short times. However, many rivers have knickpoints where a hard bed or rock or some similar feature resists erosion, and these knickpoints set the base level for the river upstream. If such a bed is abruptly eroded through, base level can rapidly drop, stranding part of the old river floodplain above the river. In the western United States, extensive river terracing is attributed to the entire western side of the continent being pushed upwards by hot mantle rock below the crust, where North American is drifting onto the East Pacific Rise. This is an enormous upwelling in the mantle, part of the mid-ocean ridge system that extends around the globe. Young river terraces are pretty obvious. The one here has been deeply eroded, and is recognizable only as a mass of loose sand and gravel of the kind typical of major river channels. 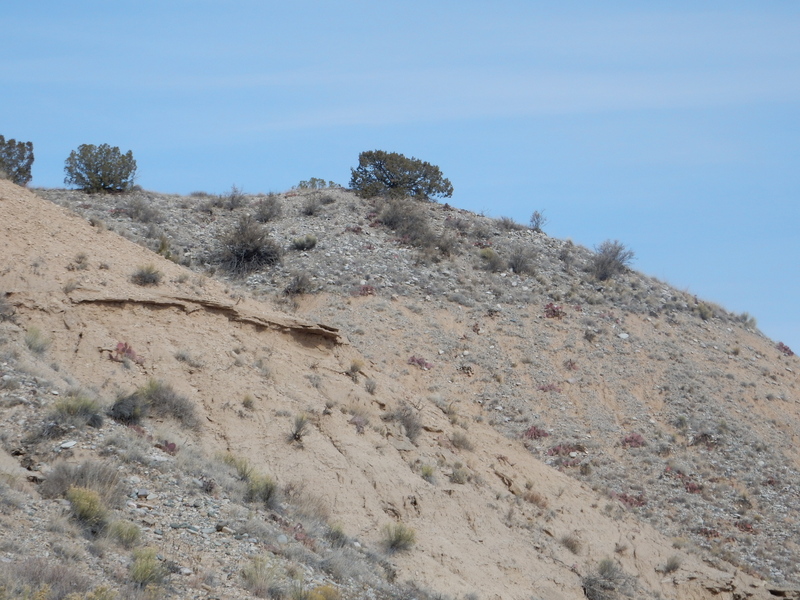 And at its base is this sandy marker bed, just above Chamita Formation beds. River capture refers to the process where two rivers running close to each other erode into each other’s channel, and one river ends up capturing all the water formerly carried by the other river. This can quite suddenly increase the watershed of the remaining river by a considerable amount. Ahead are cliffs of the Cejita Member of the Chamita Formation. To the left is the contact between the Cejita Member and the underlying Vallito Member. The contact separates the lighter tans of the Vallito Member beneath from the redder beds of the Cejita Member above. 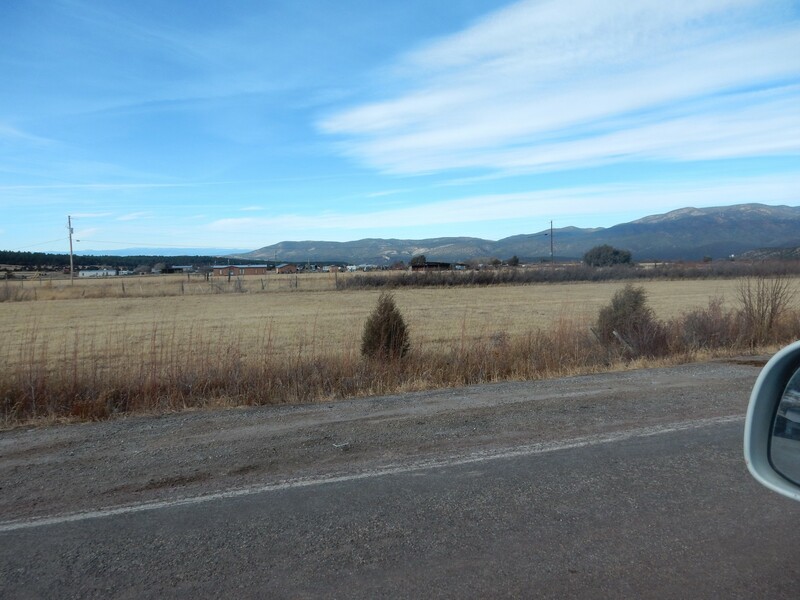 The Vallito Member is thought to be part of the floodplain of the ancestral Rio Grande while the Cejita Member thought to be sediment eroded off the Sangre de Cristo and Picuris Mountains to the east. A panorama from further north. The whitish beds, best exposed at the base of the knob at right, are part the Chamita Upper Tuffaceous Zone. But the CUTZ (geologists like acronyms even more, because they fit better on charts and maps) is actually pretty cool. It contains a fair amount of pumice, which has been radiometrically dated with high accuracy to an age of 6.7-6.8 million years. This pumice closely matches in age and composition some of the eruptions of the Peralta Tuff that forms the tent rocks at Kashe-Katuwe Tent Rocks National Monument. It was likely deposited here as air fall from the eruption plume from that eruption. 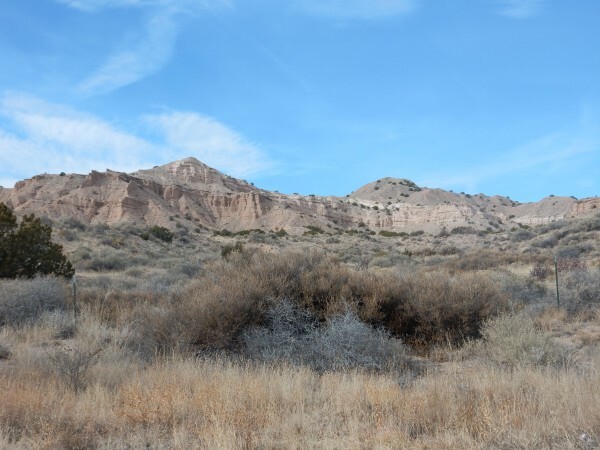 This also precisely dates this part of the Chamita Formation, which in turn helps determine the age relationships of the entire Santa Fe Group in this area. This is important because a considerable number of fossils have been dug out of the Espanola valley, and knowing the radiometric ages of the surrounding beds helps pin down the age of the fossils. 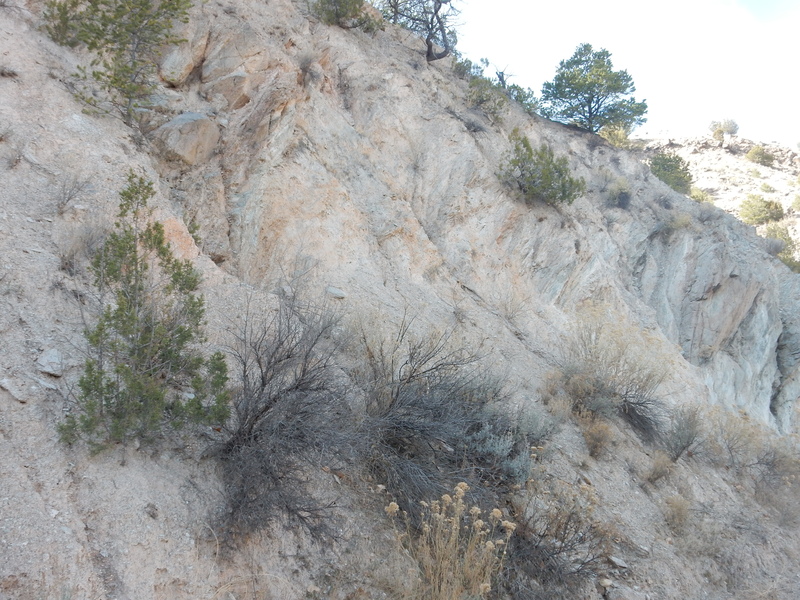 And here is a really fine example of a river terrace deposit on to of Chamita Formation. This is definitely one for the book. The only thing that could make it better was if it was less eroded, so the terrace landform were more obvious. This was striking enough to get me to pull over one more time before returning to the main highway. The gravel bed shows very well-developed imbrication, where flat rocks are lined up in the same direction. (Click to enlarge; the imbrication is clearest just above and to the right of the photograph center.) 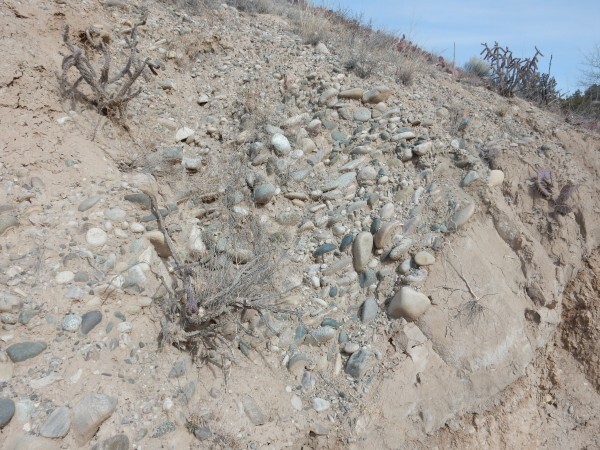 Imbrication confirms that the rocks were deposited in a rapidly flowing river, and a geologist can deduce something about the direction of flow from the imbrication. In fact, this whole road cut is pretty interesting. It looks like a river channel eroded into a surface of the Vallecito Member, in which silt and river gravel was deposited; there is a very clean contact between the silt and the older beds to the right. At left, possibly a fault displacing the beds, or a poorly defined contact with Cejita Member. But the geologic map says this whole area is a landslide. The report goes on to say that the landslide is a slump, in which the landslide moved as a more or less solid body, leaving the bedding within the landslide block intact (though often distorted). From here I proceeded to the main highway and on to Dixon. Right at the turnoff, there is an impressive edifice. 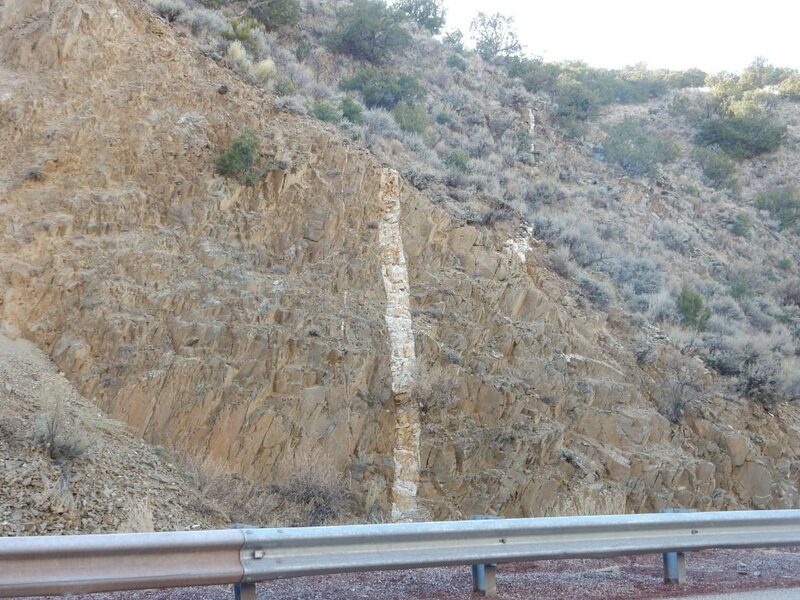 I am utterly unsurprised to see from the geologic map that this is an erosional remnant of the Ojo Caliente Member of the Tesuque Formation. 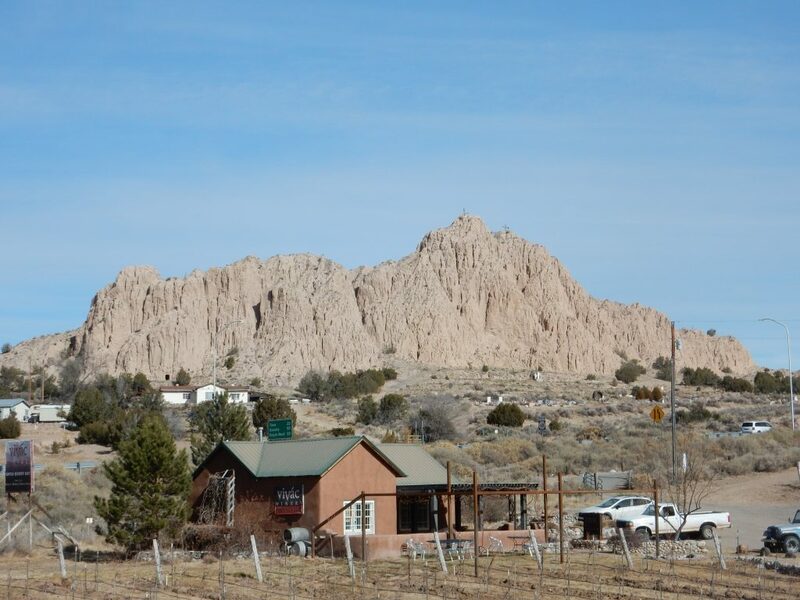 The Ojo Caliente Member is the only member of the Tesuque Formation that really stands out from other members in the field; it is always this very pale tan, almost never very well cemented, and composed almost entirely of eolian (wind-deposited) sand. 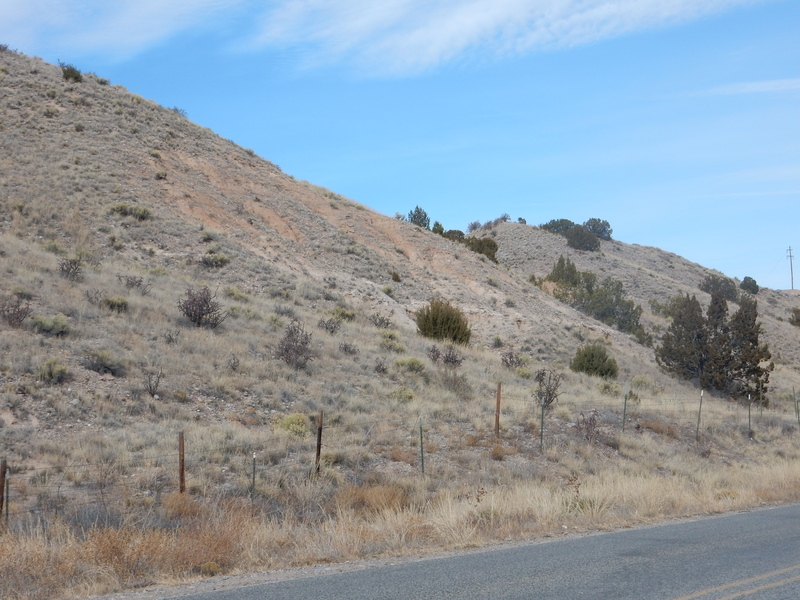 This looks like a sedimentary dike, formed along a fault where groundwater has circulated and cemented the sediments together; but while the map shows a major fault just this side of the hill, the hill is not actually centered on the fault. 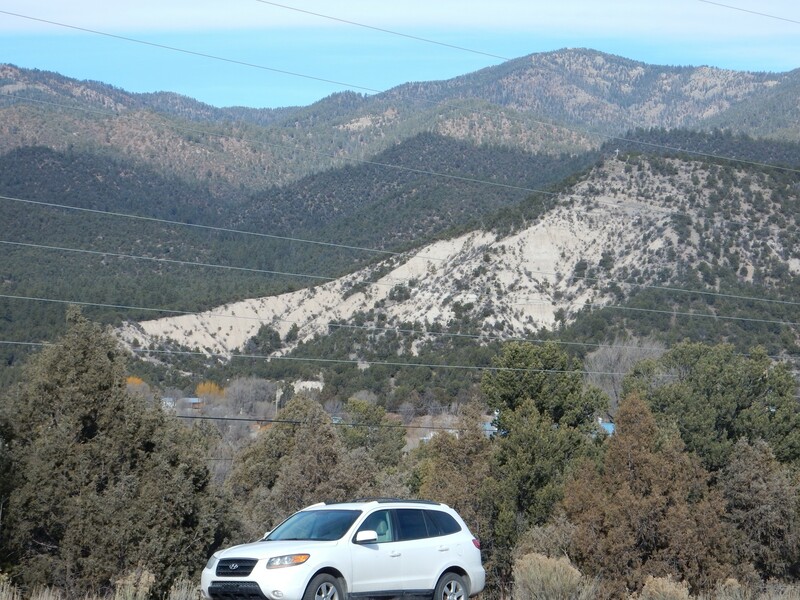 Just past the turnoff, the road cuts through more Santa Fe Group sediments. My geologic map labels this as Ttch, but the legend does not include a Ttch unit. It’s a draft map and that happens sometimes. My guess is it’s almost certainly Tesuque Formation (Tt) and probably Chama-El Rito member. The Chama-El Rito member is characterized by occasional gravel lenses that contain clasts (bits of rock) from the San Juan Mountains. It looks like there is some gravel here, but I didn’t think to check the indivdual clasts, and I don’t know that I’d recognize a chunk of the San Juan Mountains anyway. Still, nice bedding. You can see that the beds dip towards the west (left). You can also see that they are not well cemented; the road cut is heavily eroded. Most of the Santa Fe Group exposures are poorly cemented, perhaps because it’s a relatively young formation that has never experienced very deep burial. 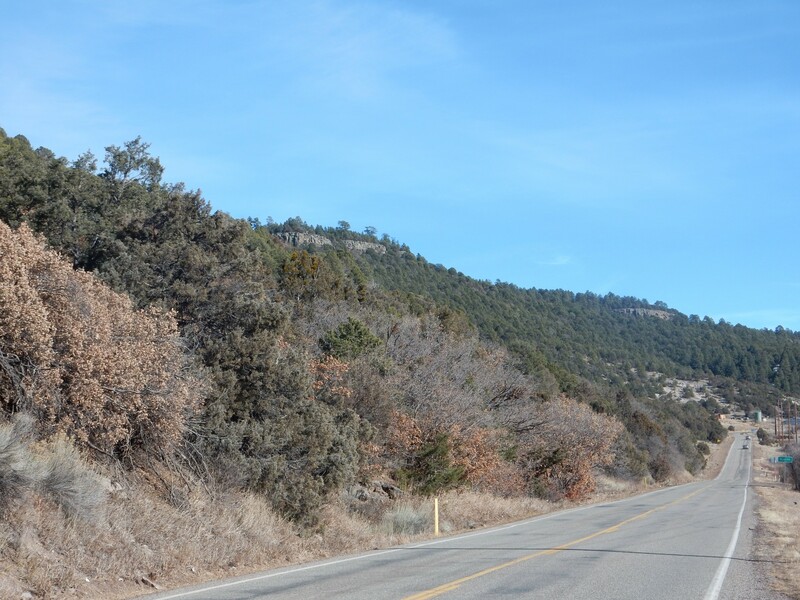 Just past the turnoff, the road cuts through an isolated hill of Precambrian rock. 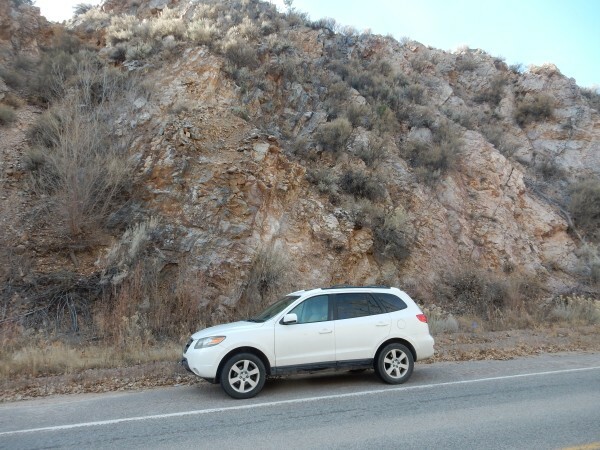 My geologic map for this area is no more specific than “Precambrian”, but my road log suggests this is Ortega Quartzite. 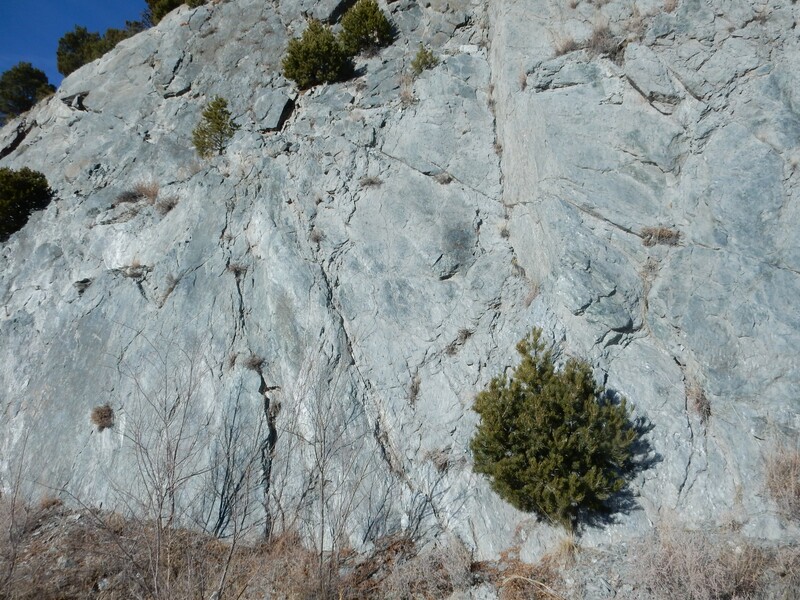 The Ortega Quartzite is part of the Hondo Group, which was deposited a little less than 1.7 billion years ago on an existing continental basement. Most of the sediment was sand, which was later deeply buried and subjected to metamorphosis that converted it to a very tough rock called quartzite. This sample is a few inches across. It’s a very clean quartzite, meaning that it contains very little mica, feldspar, or other minerals besides quartz. The Hondo Group is part of the Mazazatl Province, a patch of newly formed crust that collided with North America 1.7 billion years ago. Further north is the Yavapai Province, which is also young crust that collided with North America around a hundred million years earlier. 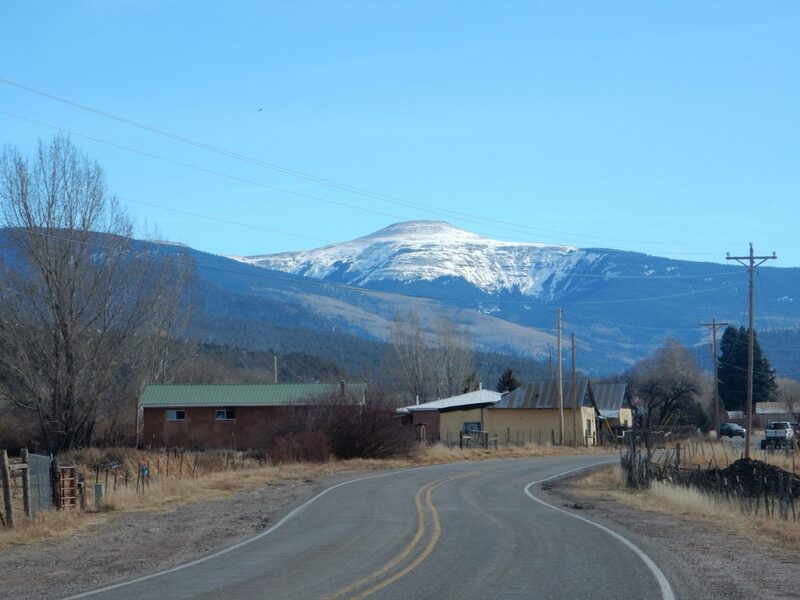 The boundary between the two roughly coincides with a chain of volcanoes, the Jemez Lineament, which stretches from central Arizona to Raton and includes the Jemez Mountains. (Quelle surprise.) Geologists believe that the collision zone was characterized by subduction of oceanic crust, and the remnants of this crust in the upper mantle contain hydrous minerals that melt relatively easily to form magma. I’ve mentioned my use of geologic maps several times. Geologic maps are wonderful and terrible. They’re indispensable for getting to know the geology of a new area, and I am in awe of the amount of work that goes into producing good geologic maps. There is almost complete coverage of the Jemez area in the map collection here, which can be downloaded for free. A high-quality geologic map of an interesting area is a treasure. At the same time, geologic maps can be terribly frustrating. They do vary somewhat in quality, in part because the dates of publication extend over decades. Newer maps naturally reflect the greater understanding that comes with time. They sometimes reflect the idiosyncrasies of the geologists who produced them, so that a geologist interested in volcanic features may be a bit skimpy in his descriptions of sedimentary units, and vice versa. Particularly frustrating, if unavoidable, are maps of adjacent quadrangles that reflect different interpretations — one map may lump all Precambrian rocks together, while the next map over maps different Precambrian units in considerable detail. Or beds assigned to one unit abruptly become beds assigned to a different unit as one crosses a map boundary. A little further down, the quartzite gives way to schist. Schist is typically formed by metamorphosis of clay, which is rich in aluminum. 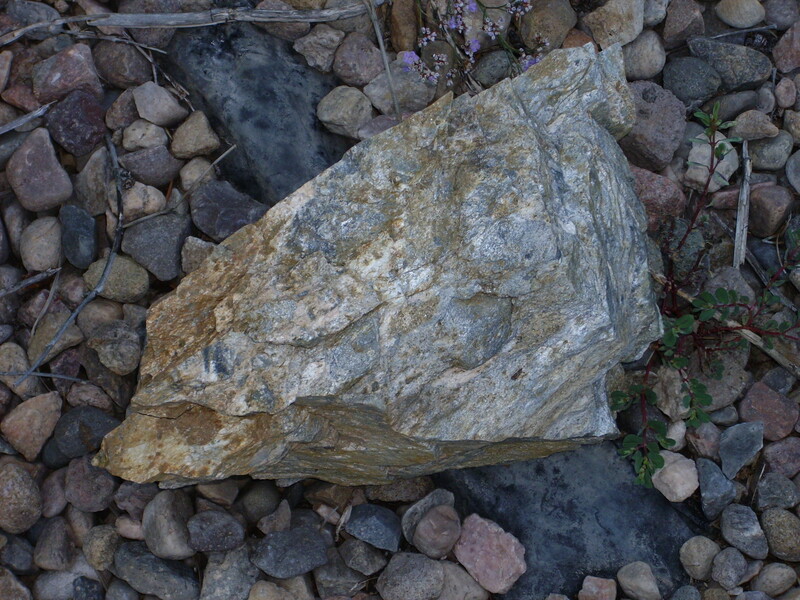 This produces a rock with characteristic aluminum minerals, of which the most important in this outcrop is muscovite, potassium mica. Muscovite forms thin layers with a metallic luster, and these make the schist look almost as if it was drenched in silver paint. Well-cystallized muscovite forms dramatic “books” in aluminum-rich granite, but the muscovite in schist is a fine-grained form called sericite. Sericite weathers easily, which gives the outcrop its rounded appearance compared with the Ortega Quartzite. The black grains in the rock are probably either garnet or staurolite. Both are aluminum-rich minerals characteristic of mica schist. I’m not mineralogist enough to be sure which. My first thought was garnet, but after staring at them through a magnifier for a while, I’m thinking staurolite. The difference is in the way the minerals fracture. Rock of this kind, if it was located deep in the crust, would easily melt to form magma, because mica contains water in its structure that lowers the melting point. 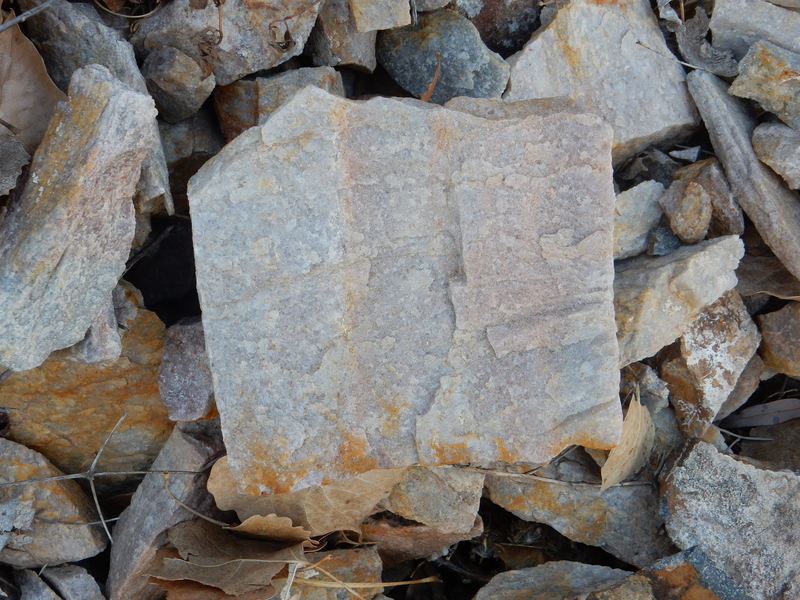 This schist likely belongs to the Vadito Group, which is a bit older than the Ortega Quartzite. The Vadito Group is thought to have formed from metamophism of various kinds of volcanic debris, which later gave way to the clean sand beds that became the Ortega Quartzite. A little further on, the road crosses the trace of some major faults of the Velarde fault zone. This is part of the eastern margin of the Rio Grande Rift, which here forms a shallow graben or rift valley. The faults have considerable lateral displacement, like the San Andreas Fault, unlike most of the faults closer to home, which are straightfoward normal faults with mostly up and down displacement. 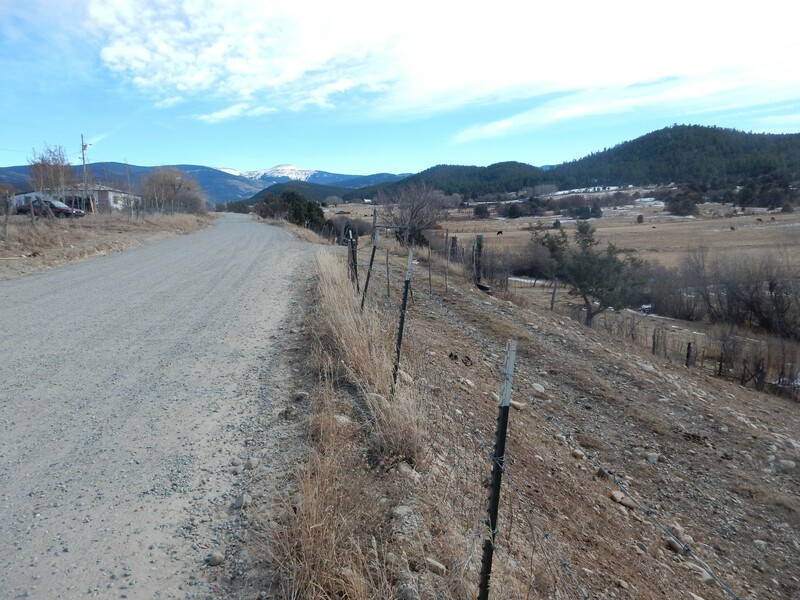 I would like to have been able to pick up the fault trace, but the road follows low ground along Embudo Creek where the fault is buried under stream alluvium. This caught my eye as I was leaving Dixon. My map for this area is a draft map and pretty unsatisfactory, but it seems to say that this is Picuris Formation, about 13 million years old, topped by terrace gravel. On the other hand, my road log has a map saying this is Chama-El Rito Member of the Tesuque Formation. Both are Santa Fe Group rift fill formations of about the same age, so some confusion is understandable. I’m more inclined to believe the first. 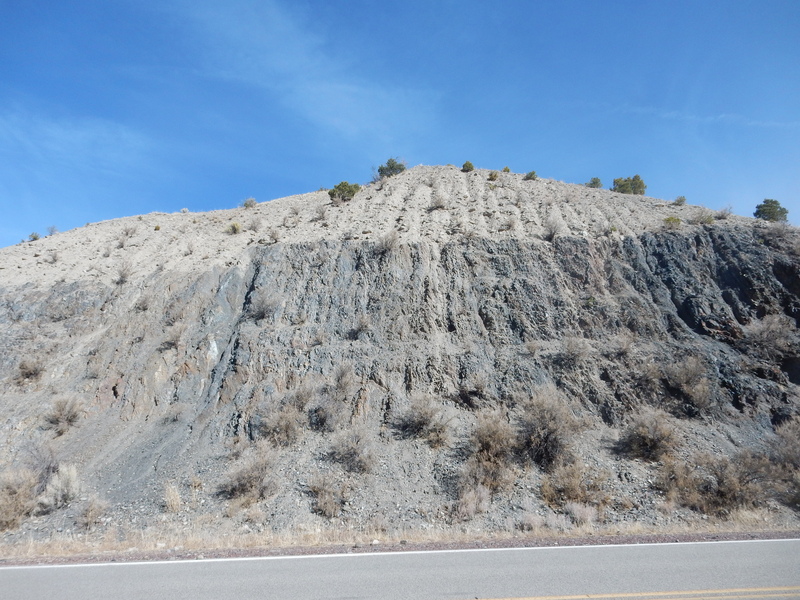 The Picuris Formation is apparently rich in debris from the Latir volcanic field north of Taos. This was definitely worth a stop. The black rock is Pilar Phyllite. 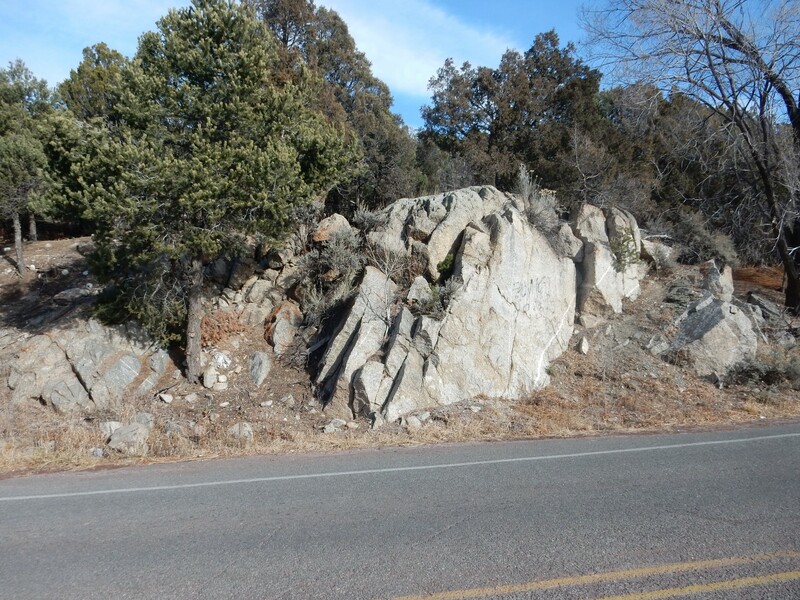 This is grouped with the Ortega Quartzite into the Hondo Group. Or I think so; the rocks here are so heavily folded and confused that the terminology has shifted a lot over the last few decades. Apparently it is only relatively recently that geologists have learned enough to be reasonably sure the Hondo Group is is younger than the Vadito Group. Regardless, the Pilar Phyllite is one reason I chose to come here today. A phyllite is a metamorphic rock formed from clay-rich sediments, similar to schist, but not quite as severely metamorphosed. This particular phyllite gets its black color from a quite high content of graphite. 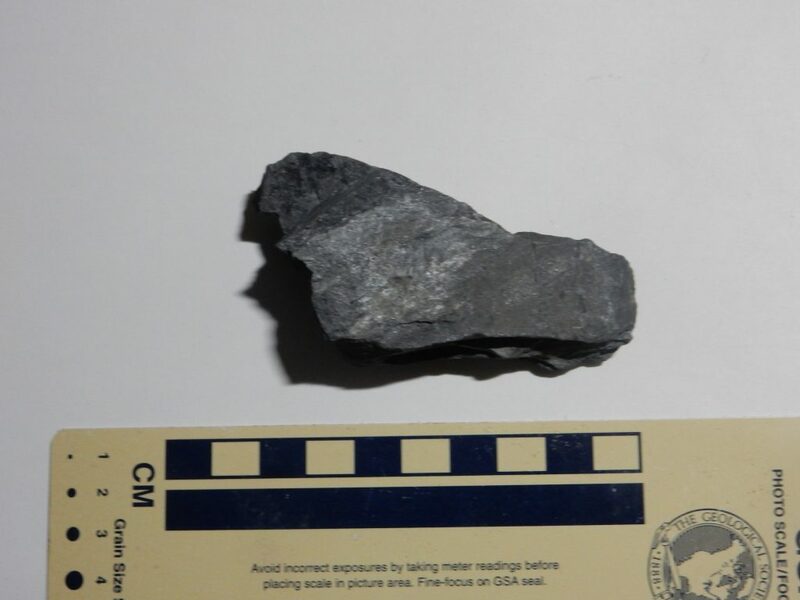 Graphite can form by inorganic processes under unusual conditions, but it’s very likely that this black rock is one of the oldest signs of life in New Mexico. 1.7 billion years ago, this was likely a shallow sea rich in nutrients from nearby volcanic activity in which cyanobacteria thrived, extracting carbon from the atmosphere by photosynthesis. It was quite a different world then. Oxygen levels were probably not more than 10% of current levels, and the air was thick with carbon dioxide. The most complex organisms were probably simple fungi and red algae, with the former possibly the top predators. Naturally I grabbed a sample. The gravel atop the black beds is geologically young river gravel. There’s more across the arroyo. A little further down, there is a very pretty dike cutting across the older rock. The dike is obviously younger than the rock it cuts across. This is probably part of the same intrusion event that formed the pegmatite at the Harding Mine. Next stop is definitely Marquenas Quartzite. 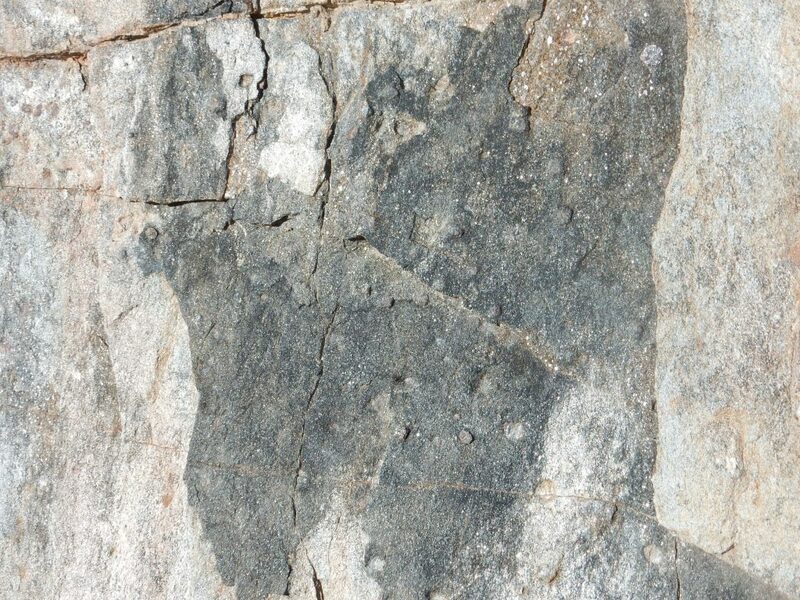 This is distinguished from the Ortega Quartzite mostly from “field relationships”, which other formations it is above and below. It’s separated from the Ortega Quartzite by the Pilar and Rinconada Formations. It also has a dirtier appearance, including a fair amount of magnetite. Magnetite is an iron oxide, Fe3O4, which contains equal amounts of ferrous (Fe++) and ferric (Fe+++) ions. By a quirk of chemistry, this is an unusually stable mineral, jet black in color and quite heavy. The beds here may very well be fossil placer deposits, where magnetite was concentrated in the lower part of a stream bed or beach because of its density. When I was a kid, we sometimes collected magnetite from placer deposits in the arroyos cutting through White Rock, using toy magnets that easily pick up this highly magnetic mineral. I don’t know what the big lumps are. They look a little like clumps of magnetite, but that seems unlikely. They are probably either garnet or staurolite, but, again, I’m not mineralogist enough to know. Continuing our descent through time, we come to the Vadito Schist. The metallic color is from muscovite, as with the earlier schist deposit. The schist here does not show the abundant garnet or staurolite grains of the earlier outcrop; it is only a guess on my part that the earlier outcrop is also Vadito schist. Further on, the schist becomes conglomeratic. With all the mica, the outcrop gleams when the angle of the sun is right. The rock here contains numerous pebbles that have been only partiallly metamorphosed. It’s a pretty enough rock that I have a chunk in my yard. 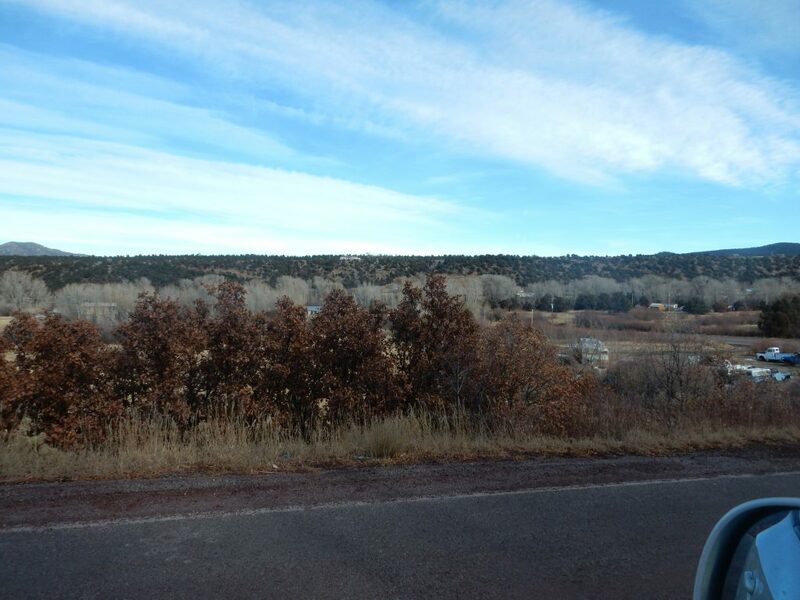 I continued on past the turnoff to the Harding Mine (which is hard to spot) and past Picuris Pueblo. 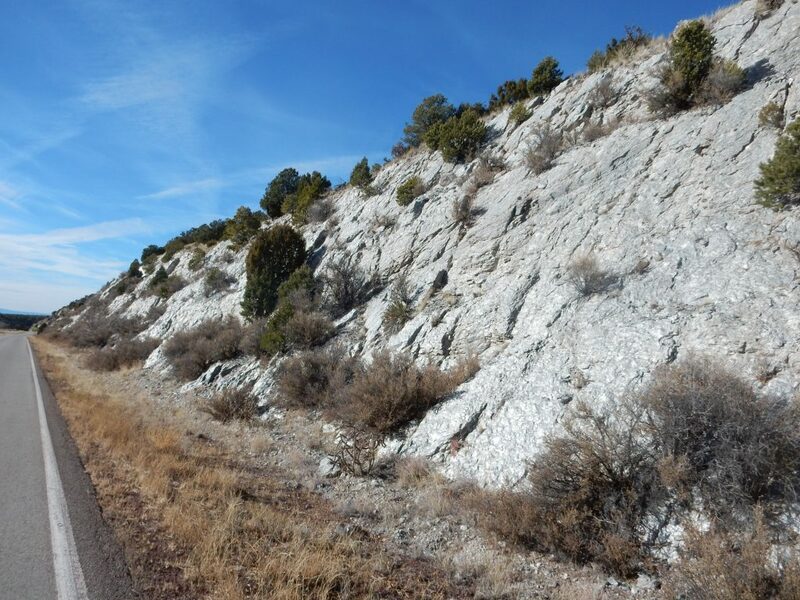 The road passes an outcrop of the Penasco Quartz Monzonite. Looks like granite? Well, it is, in the broad sense. 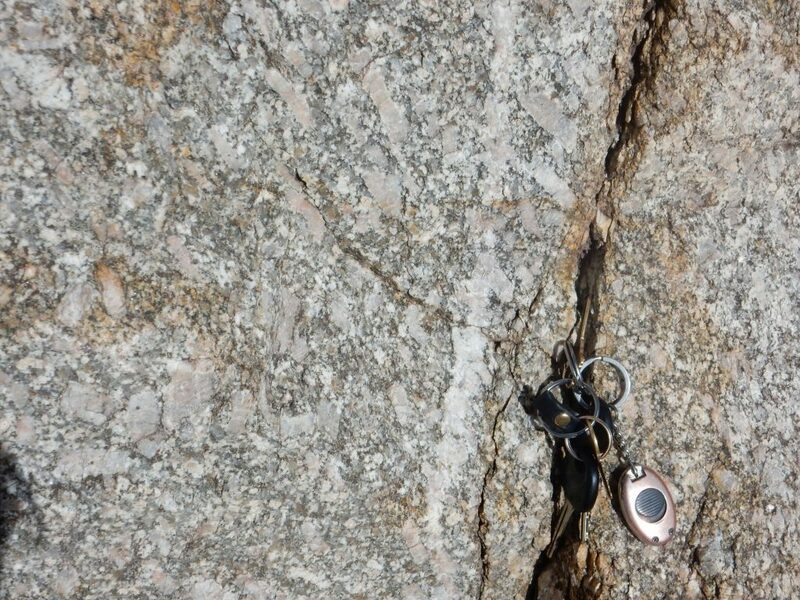 However, petrologists define granite in a fairly narrow sense as an intrusive rock rich in quartz and alkali feldspar, and true granite is not actually that common. Quartz monzonite has a bit less quartz and alkali feldspar and a bit more plagioclase feldspar, and it’s probably a much more common rock; at least, I seem to run into it all the time. Notice the dark patch of rock just below center in the photograph. This is an inclusion of rock of different character from the quartz monzonite. These are powerful evidence that granites do form from liquid magma — though perhaps not conclusive evidence; the geologists who argue that most granites form by metamorphism aren’t stupid, after all. 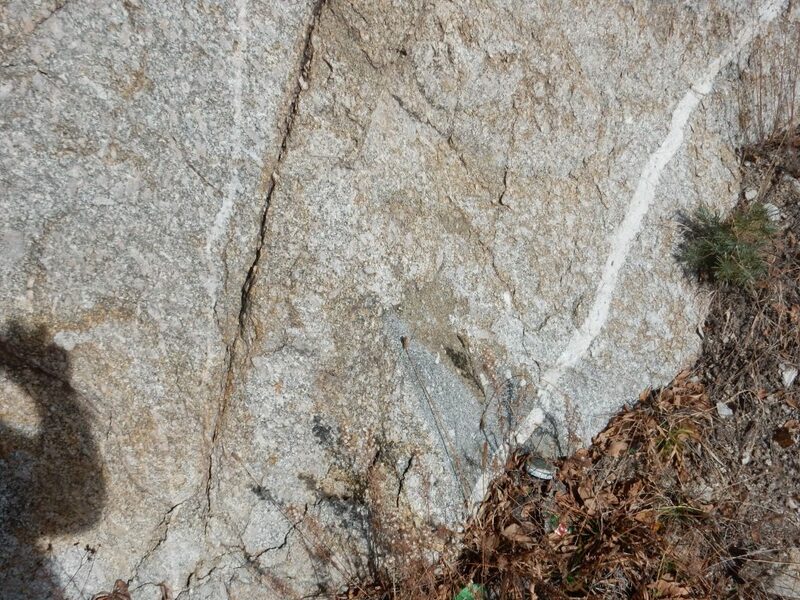 There are also small veins cutting across the granite … er, quartz monzonite. 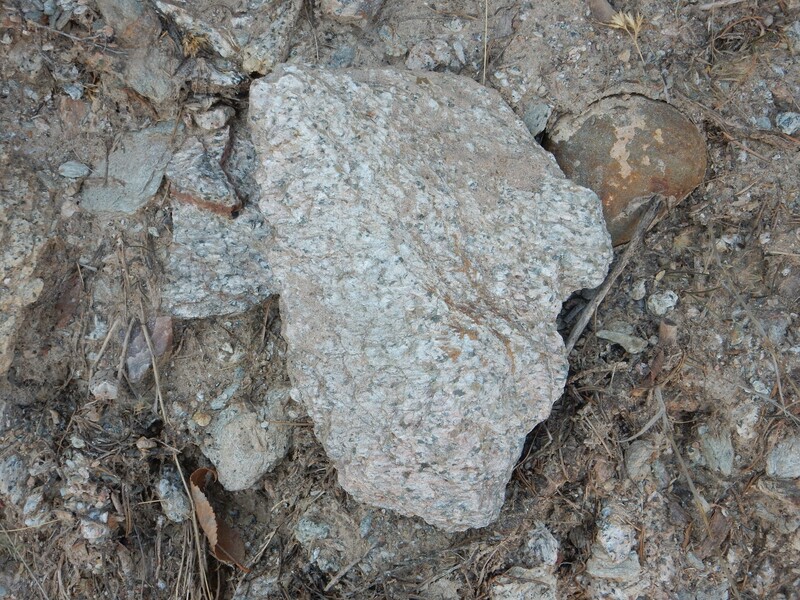 Intrusive rock shrinks as it solidifies and cools, like most materials, and this tends to cause the rock to fracture. The factures are quickly filled with quartz and other unusually water-soluble minerals brought in by hydrothermal fluids, probably originating from the intrusive body itself. I proceed through the village of Penasco,, taking the turn north to Vadito. Here there is a spectacular exposure of the Picuris Formation. This formation has only recently been well studied, and it turns out to cover an unusually broad age range, from 28 million to 15 million years. The beds are composed of poorly cemented sand and volcanic ash, the ash giving the beds their light color. This is about 5.7 million years old, based on radiometric dating, and erupted from vents somewhere to the east. We’re well into the mountains here, and the Sangre de Cristo were produced by movement along faults during the Laramide Orogeny, rather than by volcanism; but some magma made its way to the surface in relatively recent geologic time. I turned around at this point. I wanted to see some glacial features. There is little evidence of glaciation in the Jemez, but some glaciers were present in the Sangre de Cristo during the last glaciation. 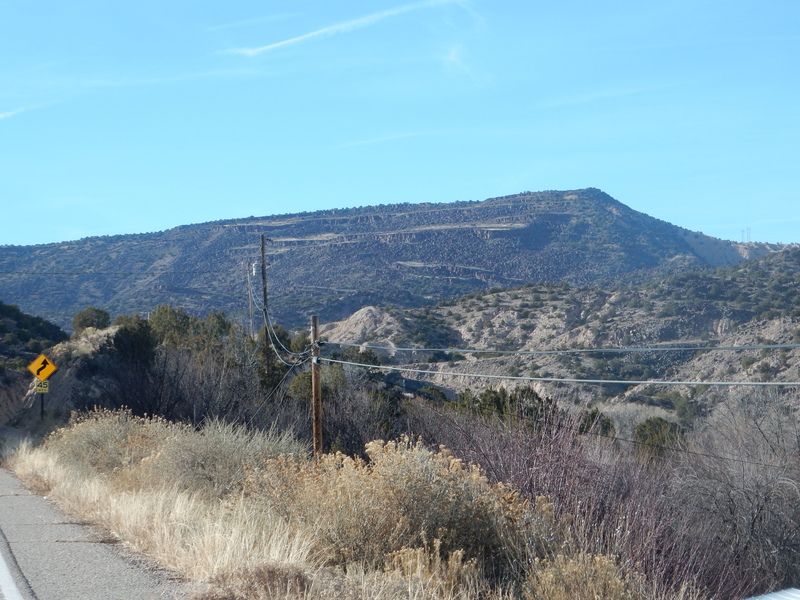 I returned to Penasco and took the road to Rodarte. This area is the valley of the Rio Santa Barbara, which is unusually flat ground, and which is flanked by high terraces that stand out on the topographic map. My road log speculates that the terraces are glacial outwash terraces of Wisconsin age, the most recent glaciation, which took place between 85,000 and 11,000 years ago. There are actually a third geomorphic surface in this area, above the valley floor and the flanking terraces. The oldest surface is defined by the flat tops of the hills surrounding the valley, such as this one. The exposed beds are mapped as Dixon Member, Tesuque Formation, Santa Fe Group. This illustrates just how much regional uplift New Mexico has experienced in the last few million years. This area was low enough to accumulate sediments ten million years ago, but is now well up in the foothills of the mountains. The relatively flat surface at right is the Oso geomorphic surface, of which remnants are found throughout this area. This is what is left of one of the earliest floodplains of the Rio Grande Rift, now long abandoned by the rivers that formed it as a result of regional uplift. The natural amphitheaters to the left and right of the peak are almost certainly cirques, also known as corries or cwms. (Cwm is in the dictionary and is a great word to have in you arsenal when playing Scrabble.) They are valleys carved by glaciers near their source. Jicarita Peak itself is very nearly a horn, where cirques around the flanks of a mountain erode it to a needle point. There are two more cirques on the far side of the mountain, one of which reaches nearly to the peak, but these did not quite converge before the current warm spell put a stop to glaciation for the moment. Look how flat the valley of the Rio Santa Barbara is. Gravity is a relentless leveling force, rapidly filling even mountain valleys like this one with very flat beds of sediments. Here the road approaches the southern of the two terraces flanking this valley. You can see that the top of the terrace is perfectly flat. The first European settlers were evidently struck by this as well, naming this the Llano Santa Barbara, “llano” being Spanish for “plain”. Here’s a view from the top. 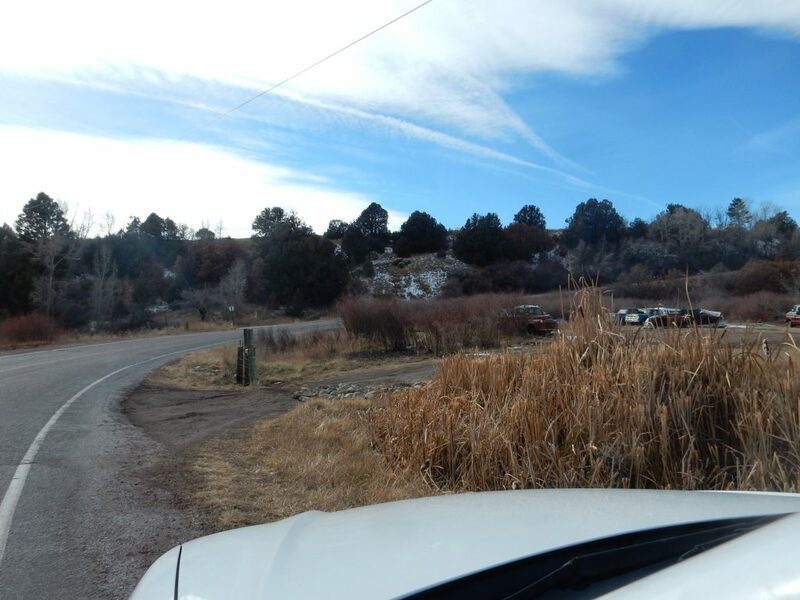 I drove on through the village of Llano and along the north rim of the terrace. You can see that the rim is quite well-defined and extends for a considerable distance, with a small creek at its foot. The terrace is composed of boulders and very coarse gravel, but I didn’t see the angular boulders typical of gracial debris. So which came first, the escarpment or the creek? Is the creek eroding its way north, into the escarpment, keeping it steep? Or is the escarpment channeling the creek? I don’t know, but I’d guess the latter. I pause at this point to eat my lunch. Atkins bars, Glucerna shakes, cheese stick and nuts; diabetic-friendly. Man, I hate being diabetic, even if it’s essentially in remission at this point. Y’all keep your weight down. There is an analogous terrace north of the Rio Santa Barbara. You can see the very flat surface across the valley. Time to head for home; I have some shopping to do in Espanola before it gets too late. I cannot resist one more shot along the road. Notice the terrace-like features on the northeast tip of Black Mesa. My first thought was that these were Toreva blocks, formed when an entire block of a cliff comes loose and slides down the side of the cliff as a solid body. However, Toreva blocks are usually rotated inwards, towards the cliff from which they came loose, and these are rotated outwards (towards the viewer), so they are a less dramatic form of slumping. Still. 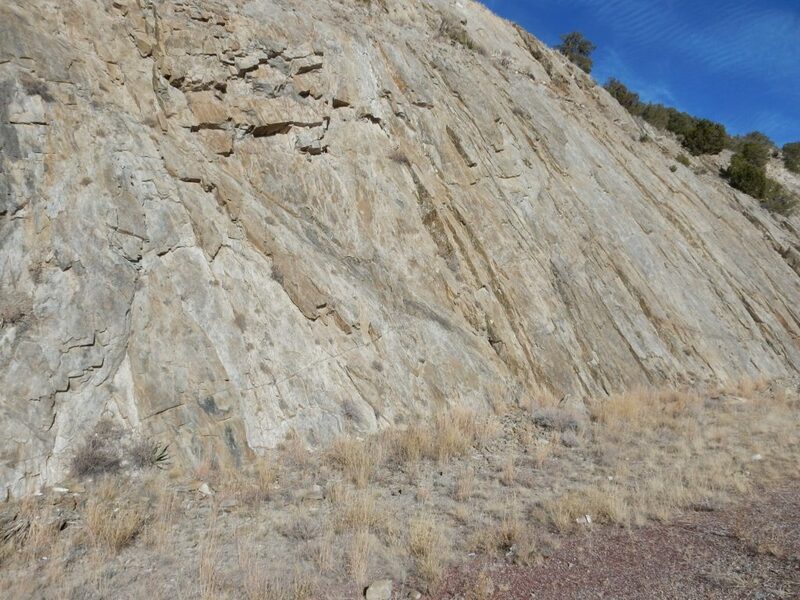 This kind of landslide feature is almost a sure thing whenever resistant beds (here, the Servilleta Basalt capping Black Mesa) rest on very soft beds (here the Ojo Caliente Member of the Tesuque Formation.) There is faulting all along the southeast face of Black Mesa, marking the western edge of the Velarde graben, and this doubtless contributes to the slumping. I am struck how, in January, early morning seems to go directly to late afternoon without any middle of the day. It was already two in the afternoon but it felt like it was still early morning. It’s the angle of this sun this time of year. It tends to throw off my internal compass. Got to Espanola, Found a match for the latch I need to replace, and picked up my week’s supply of groceries. Then home.